"Antártida Argentina" redirects here. For the railway station in Rosario, see Antártida Argentina railway station. Argentine Antarctica (Spanish: Antártida Argentina, Sector Antártico Argentino or Argentártida) is a sector of Antarctica claimed by Argentina as part of its national territory consisting of the Antarctic Peninsula and a triangular section extending to the South Pole, delimited by the 25° West and 74° West meridians and the 60° South parallel. This region overlaps with British and Chilean claims in Antarctica; however, all claims are suspended by the Antarctic Treaty System, of which Argentina is a founding signatory and permanent consulting member, with the Antarctic Treaty Secretariat being based in Buenos Aires. 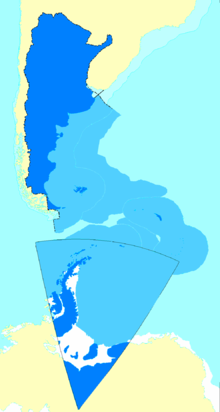 Argentine Antarctica map since 1950. Orcadas base from 1904. Administratively, Argentine Antarctica is a department of the province of Tierra del Fuego, Antarctica, and South Atlantic Islands. The provincial authorities reside in Ushuaia and the Governor annually designates his or her delegate for the Antarctica region. The "civil power" of any of the administrators extends no further than that nation's own bases. The South Orkney Islands are part of Islas del Atlántico Sur (South Atlantic Islands) Department, which include Falkland Islands and South Georgia and South Sandwich Islands (according to Argentine claim). The Argentine exploration of the continent started early in the 20th century. José María Sobral was the first Argentine to set foot on Antarctica in 1902, where he spent 2 seasons with the Swedish Antarctic Expedition of Doctor Otto Nordenskiöld. Shortly afterwards, in 1904, the Orcadas permanent base was already fully operational. Years later other bases would be created, some permanent and others seasonal. The first Argentine expedition to reach the South Pole was the 1965 Operación 90. Argentine activities in Antarctica are coordinated by the Instituto Antártico Argentino (IAA) and Dirección Nacional del Antártico (DNA). The estimated Argentine Antarctica area is 1,461,597 km2 (564,326 sq mi), of which 965,597 km2 (372,819 sq mi) is land. The ice in the glacier shell has a thickness of 2 km on average. Temperatures range from 0 °C in summer and -60 °C in winter although in certain points may drop to approximately -82 °C. Time zone UTC-3 is used as in the South American continent. Argentina has six permanent Antarctic Stations and seven Summer Stations with a total of 13. According to the last Argentine national census, in October 2010 (winter) there were 230 inhabitants in the six permanent bases, including 9 families and 16 children as follow: 75 at Marambio, 66 at Esperanza, 33 at Jubany, 20 at San Martín, 19 at Belgrano II and 17 at Orcadas. In 1815 Guillermo Brown, an Irish Marine Commodore in the service of the United Provinces of Río de la Plata, launched a campaign to harass the Spanish fleet in the Pacific Ocean. When rounding Cape Horn aboard the Hercules and Trinidad, strong winds pushed them to parallel 65 S. Some Argentine sources say that Brown had sighted Antarctic land on the expedition, saying that is the reason why in Argentina cartography often called the northernmost part of the Antarctic Peninsula Tierra de la Trinidad. In 1818 the government of the United Provinces of Río de la Plata granted the first concessions for hunting seals and penguins in the Antarctic continent to Juan Pedro de Aguirre, who operated with ships Pescadora Director and San Juan Nepomuceno. In the petition that was presented Aguirre, he has requested authorization for installation of an establishment for seal hunting in some of the existing islands off the South Pole. The Argentine sealer Santo Spiritu under Captain Carlos Tidblom, was followed in September 1819 from the Falkland Islands by the American brig Hercilia (commanded by Nathaniel Palmer) catching up on Deception Island in the South Shetland Islands. The fact that these sealers were directed to the islands with fixed course is usually regarded as proof that they were previously known. On 10 June 1829 the government of the province of Buenos Aires issued a decree creating the Political-Military Command of the Malvinas Islands (see Louis Vernet) including the islands adjacent to Cape Horn, which plays in Argentina and that included the Antarctic islands. In 1848 Luis Piedrabuena traveled to Antarctica as a ship's boy of William Smiley. Otto Nordenskjöld (right) with José María Sobral (left) in Snow Hill Island, circa 1903. The 10 October 1900 the Argentine government decided to join the International Antarctic Expedition, consisting of several expeditions, but the Argentine did not travel and collaboration offered to the Swedish expedition led by Otto Nordenskjöld. This Argentine receive support in exchange for incorporating an Argentine Navy to dispatch and deliver scientific data and zoological collections that pick. On their way through Buenos Aires lieutenant Jose Maria Sobral boarded the ship Antarctic on 21 December 1901. As no news of the expedition reached the Argentine government, it then fulfilled its commitment to support the expedition by renovating the corvette ARA Uruguay, which then set out on search on 8 October 1903, under the command of Lieutenant Julián Irizar, finding and rescuing members of the expedition who had been wintering following the collapse of the Antarctic. The expedition built a hut on Snow Hill Island in 1902. The Argentine Navy took possession of the hut in 1954 and named it Refugio Suecia. Currently it is an Argentine historical monument and historical site and monument as appointed by the Antarctic Treaty. The 1902 expedition built another hut in Hope Bay, it is also Argentine and an Antarctic monument under the control of Esperanza Station. Omond House, Laurie Island, circa 1903. On 2 January 1904 the Argentina acquired the weather station installed by Scotsman William Speirs Bruce, in Laurie Island in the South Orkneys, where he had been a crew of six men making scientific observations. In it a meteorological observatory, where he also worked a post office was installed. Civil (employee of the Argentine company official post and telegraph) Hugo Alberto Acuna accounted hoist for the first time in an official way the flag of Argentina on the Argentine Antarctic sector, on 22 February 1904. Such an observatory became the Orcadas Base the oldest existing today across the Antarctic territory permanent human settlement. The Argentine corvette ARA Uruguay returned to Antarctica in 1905 (sailed from the port of Buenos Aires on 10 December 1904) to relieve staffing of the South Orkney and refer to Deception Island and Wiencke Island in search of Jean-Baptiste Charcot, whose French Antarctic Expedition (1903–1905) was believed to be lost. Thanks to Argentine collaboration with his expedition, Charcot named an insular group as Argentine Islands. One of these islands was named as Galindez Island in honor of the captain of the Corvette, Ismael Galíndez, and another was named Uruguay Island, in homage to the Argentine Corvette. The Argentine Government decided to add two meteorological observatories, in the South Georgia Island and Wandel Island, who already had on the islands Laurie and Observatorio (near Isla de los Estados). Expeditions to the Wandel Island failed in two attempts. In June 1905 the transport ARA Guardia Nacional under the command of the Lieutenant Alfredo P. Lamas carried forward the task of raising the Observatory in Grytviken in Cumberland Bay, renamed in Spanish Bahía Guardia Nacional. On 30 March 1927 was inaugurated in the South Orkney Islands the first radiotelegraph station in Antarctica. On 15 December 1927 the General Directorate of post and Telegraph from Argentina informed to the International Bureau of the Universal Postal Union about their Antarctic claims and other islands of the South Atlantic. In 1939, Argentina created temporarily (to attend a Norwegian invitation) the National Commission of the Antarctic by Decree number 35821, but by the Decree number 61852 of 30 April 1940 became a permanent body in order to intensify research in the area. Explorations, scientific tasks, were gathering ground and marking. In October 1941, the Instituto Geográfico Militar published maps showing the extent of the future Argentine claim between the 25° W and 75 ° W. In January 1942 the Argentine Government, according to the theory of polar sectors, said their Antarctic rights between the Meridian 25° and 68°24' West (of Punta Dúngeness). The Argentina held at Deception Island its formal takeover of the Antarctic land on 8 November 1942, by placing a cylinder containing a report and a flag left there by an expedition under the command of the captain Alberto J. Oddera. In January 1943 the British ship HMS Carnarvon Castle staff destroyed the evidence of Argentine inauguration, planted the British flag and sent to Buenos Aires the Act. On 5 March of that year the Argentine vessel ARA 1° de Mayo removed the British flag. In 1946, the National Antarctic Commission set new limits for the Argentine Antarctica between the Meridian 25° and 74° West (of the far east of the South Sandwich Islands). Chile and the Argentina signed on 4 March 1948 a mutual agreement in protecting and defending legal rights territorial Antarctic, mutually recognizing their claims. On 7 April 1948, by Decree No. 9905 settled the administrative unit of the Argentine Antarctic Sector of the maritime Governor of the National Territory of Tierra del Fuego. By her Decree No. 17040 of 9 June the "Antarctic and Malvinas Division" was created under authority of the Argentine Ministry of Foreign Affairs. Caterpillar tractor from the first Argentine expedition that reached the South Pole in 1965. First continental Argentine base in Antarctica, the Almirante Brown Naval detachment was opened in 1951. The following year opened the Esperanza Naval detachment (now Esperanza Station). While building this last base at hope Bay, occurred the first shooting war in Antarctica on 1 February 1952, when a team of coast Argentine, after a warning, fired over the heads of a burst of machine gun and forced to re-embark a civil team of the Falkland Islands Dependencies Survey unloading materials of the ship John Biscoe intending to restore the British base "D" burned down in 1948. On 17 January 1953 was inaugurated at Deception Island the Refugio Teniente Lasala (a hut and a tent) by staff of the Argentine ship ARA Chiriguano, becoming a Sergeant and a corporal of the Argentina Navy. On 15 February, in the incident of Deception Island, landed 32 Royal Marines of the British frigate HMS Snipe armed with Sten submachine guns, rifles and tear gas capturing two Argentine sailors. The Argentine refuge and a nearby uninhabited Chilean hut were destroyed and Argentine sailors were delivered to a vessel of that country on 18 February to South Georgia. A British detachment stayed three months on the island while the frigate patrolled waters until April. On 4 May 1955 the United Kingdom filed two lawsuits against the Argentina and Chile respectively, the International Court of Justice in The Hague so this declared the invalidity of claims of sovereignty of the two countries on Antarctic and sub-Antarctic areas. On 15 July 1955, the Chilean Government rejected the jurisdiction of the Court in that case and on 1 August the Argentine Government did also, by what the demands on 16 March 1956 they were archived. On 1 December 1959 was signed the Antarctic Treaty by Argentina, Australia, Belgium, Chile, France, Japan, New Zealand, Norway, South Africa, the Union of Soviet Socialist Republics, the United Kingdom and the United States, entering into force on 23 June 1961. In the 1960s the State of Argentina, with its fleet, pioneered the realization of ecological tourist cruises to Antarctica. At the same time, the Argentine State-owned Aerolineas Argentinas inaugurated passenger flights between Ushuaia and Sydney making scale in Marambio Base. Between the mid-1960s and the first half of the 1970s the Argentina launched rockets from its Antarctic bases. These rockets were designed and built entirely in the Argentina and possessed meteorological instrumentation and radiation sensors. Operación 90 was the first Argentine ground expedition to the South Pole, conducted in 1965, by ten soldiers of the Argentine Army under then-Colonel Jorge Edgard Leal. The operation was named for the target 90 degree South latitude point (the geographic South Pole). On 8 April 1970, the Governor of Tierra del Fuego issued the Decree N ° 149 creating 4 departments, among them the Argentine Antarctic Sector Department. In 1977 the Esperanza Base was elected to as the place of filing of Argentine families that traveled at the end of that year to overwinter at the base. The first director of the Argentine Antarctic Institute, general Hernán Pujato, was the forerunner of the installation of the Fortín Sargento Cabral when on 13 August 1954 he proposed the Argentine Government create a farmhouse out cape Spring to populate it with family groups. The idea had aimed strengthening the Argentine rights in that part of Antarctica. After finishing the construction of the houses, the Fortín Sargento Cabral was inaugurated on 17 February 1978. Having then 5 houses for families who wintered there that year. The first human born in Antarctica, the Argentine Emilio Palma did it in Esperanza Station in 1978, within the territory claimed by the Argentina. His baptism in the Catholic chapel on 7 January 1978 was the first on the continent. On 18 December 2012, the Foreign & Commonwealth Office of the United Kingdom announced that the southern part of British Antarctic Territory (and Argentine Antarctica) has been named Queen Elizabeth Land in honour of Queen Elizabeth II. Argentina, which lays claim to part of the area, criticised the naming. In 2013 the Argentine Defense Ministry announced that Petrel Base will become a permanent base by 2015. The base will have an airport and logistics for transfer of passengers and cargo. Watercraft in Hope Bay, Antarctica. The geographic structure of the Argentine Antarctica continues some features of the Patagonia, located to the north of it. The highest peaks are located at the south of the Antarctic Peninsula, which has islands and archipelagos nearby. The land is under an ice sheet. The climate of the region ranges from a subpolar climate in the north to a polar climate in the south. The region has an extremely cold climate with mean temperatures below 0 °C (32 °F) with frost and snowfall occurring throughout the year. In general, there are two different climatic zones found within the region: a glacial climate in the interior and an oceanic one in the Antarctic Peninsula and adjacent islands. The glacial climate found in the interior is dominated by continental ice sheets and glaciers while in the Antarctic Peninsula and its adjacent islands, the climate is characterized by very strong winds, particularly in winter. In particular, the Antarctic Peninsula experiences strong cold winds and blizzards. In the interior of the continent, the climate is colder and drier due to the higher latitude, altitude, and strong continental influences. Mean annual temperatures range from between −10 to −20 °C (14 to −4 °F) in the Antarctic Peninsula to −30 to −50 °C (−22 to −58 °F) in the interior. Temperatures are always low in the region; during the polar night in winter, temperatures drop down to −42 °C (−44 °F). In the warmest month, mean temperatures are usually below 0 °C (32 °F). Coastal areas have mean temperatures in the warmest month at around freezing. Precipitation mainly falls as snow. Due to the ice sheets and glaciers covering most of the region and the severity of the climate, the flora is sparse and limited only to coastal areas. The flag of Argentine Antarctica was adopted in 1999, after being designed by an Argentine architect Teresa Beatriz Martinez, who herself hailed from the province of Entre Ríos. The flag was nicknamed the Albatross, wherein the orange portion reflected the geography of Tierra del Fuego province, and the blue symbolizes the sky and sea surrounding the province, while the Southern Cross reflects the night sky and the albatross itself is a local bird that represents freedom through flight. Argentine bases on the Antarctica (permanent bases in red). The icebreaker Almirante Irizar, the principal supply line for Argentine bases in Antarctica since 1978. Esperanza and Marambio are the biggest Argentine bases, holding together 70 buildings, an average of 110 people during the winter, and over a maximum of 250 during the summer. Orcadas Base, located at the South Orkney Islands off the Antarctic mainland (see map, right), was the world's first base in the Antarctic region, operating continuously since 1903. The southernmost Argentine permanent base is Belgrano II, at over 77 degrees south. The southernmost summer base is Sobral, at 1,450 km (901 mi) from Belgrano II. The bases are supplied by the ships: Puerto Deseado, Suboficial Castillo, and Almirante Irizar, and by C-130 Hercules and DHC-6 Twin Otter aircraft. Belgrano II, (77°52′S 34°37′W﻿ / ﻿77.867°S 34.617°W﻿ / -77.867; -34.617). Laboratory and meteorological station Argentine southernmost base (since 1979). Esperanza (63°24′S 57°00′W﻿ / ﻿63.400°S 57.000°W﻿ / -63.400; -57.000). Hope Bay. Laboratory and meteorological station (since 1952). Radio LRA36 Nacional Arcángel San Gabriel, School #38 Presidente Raúl Ricardo Alfonsín (since 1978), Catholic Chapel, Post, Gym, Civil registration, port, tourist facilities. Orcadas Base (60°44′S 44°44′W﻿ / ﻿60.733°S 44.733°W﻿ / -60.733; -44.733). South Orkney Islands (since 1903). San Martín Base (68°08′S 67°06′W﻿ / ﻿68.133°S 67.100°W﻿ / -68.133; -67.100) (since 1951). Laboratory and Meteorological measurements. Groussac hut on Petermann Island. Argentina and all its territorial claims. Argentine Antarctic claims are based on historical and geological considerations: Argentina's continued human presence since 1904, and the proximity to the South American continental part of Argentina. The exercise of sovereignty over Argentine Antarctica made effective in all aspects that are not limited by the signing of the Antarctic Treaty in 1959. According to historical claims, the Argentine presence in the section began during the first decade of the 20th century; though some even affirm that it took place by the end of the previous century. However, navigators from other countries claimed the discovery of Antarctica for themselves. By the end of the 20th century the aid lent by Argentina to foreign expeditions, in particular that of Nordenskiöld, Gerlache and Charcot, was properly appreciated. This included the assignment of Argentine place names to Antarctic geographic features, such as the Argentine Islands, Uruguay Islands, General Roca, Quintana, and others. In 1904, the permanent occupation began with the opening of Orcadas Base on Laurie Island just off the Antarctic mainland. Argentina was the only nation to have an Antarctic base for 40 years until the British built a base on the same islands. The Antarctic peninsula is geologically and geographically part of the Andes. Argentina has maintained a permanent occupation for more than a century, and controls the oldest base in Antarctica (Orcadas Station on Laurie Island). Argentina conducts many rescue missions in Antarctica. Argentina has constructed lighthouses and other navigational aids in Antarctica. Argentina constructed Antarctica's first airport in 1969. Argentines form more of Antarctica's peninsula's population than nationals of any other country. The first Antarctican was born in Esperanza Base (Hope Base), namely Emilio Palma. Argentina has sent more people to Antarctica than all the other countries together. Argentina's claim to the Antarctic Peninsula overlaps with the Antarctic claims of Chile, 53°W to 90°W, and the UK claims, 20°W to 80°W. Currently, there are no attempts by Argentina or any other country to enforce territorial claims in Antarctica. See List of Antarctic territorial claims. None of these claims have international recognition and have been suspended by the Antarctic Treaty in 1961. Children, teenagers and teachers of the school of Esperanza Base. In 1978, the first Antarctic baby was born in the Fortín Sargento Cabral at the Esperanza Base under the name Emilio Palma. 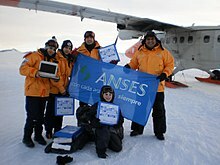 María de las Nieves Delgado was the first Antarctic girl, born on 27 March 1978 at Esperanza Base. For 1980 were over six children born in the base: Rubén Eduardo de Carli (21 September 1979), Francisco Javier Sosa (21 September 1979), Silvina Analía Arnouil (14 January 1980), Jose Manuel Valladares Solis (24 January 1980), Lucas Daniel Posse (4 February 1980) and Maria Sol Cosenza (3 May 1983). The base has an Argentine civil registry office where there have been aforementioned births and weddings. ^ Pequeño Larrouse Ilustrado 1990, para la Argentina, ajustado a la cartografía oficial por el Poder Ejecutivo Nacional a través del Instituto Geográfico Militar (IGM) acorde Ley 22.963 aprobada por expediente del 5-10-1989. ^ Beck, Peter J. (1986). The international politics of Antarctica. Routledge. p. 119. ISBN 0-7099-3239-1. ^ "ATS – Secretariat of the Antarctic Treaty". Buenos Aires: Antarctic Treaty Secretariat. 2013. ^ Hon. Cámara de Senadores, Comisión de Cultura, Antecedentes de Proyecto de Ley, Orden del Día Nº 590 del año 2008. ^ "List of Historic Sites and Monuments approved by the ATCM" (PDF). Antarctic Treaty Secretariat. 2012. Retrieved 30 December 2013. ^ Historic Huts of the Antarctic from the Heroic Age Archived 8 February 2013 at the Wayback Machine – Scott Polar Research Institute (2010). ^ Historia y Arqueología Marítima. Churchill envió una fragata para repeler la "invasión" de las Malvinas por dos soldados Argentinos en 1953. ^ "Antarctica (United Kingdom v. Argentina)". Archived from the original on 9 September 2015. Retrieved 3 May 2015. ^ "Regiones argentinas" (in Spanish). Embassy of Argentina in the Socialist Republic of Vietnam. Archived from the original on 11 November 2016. Retrieved 11 November 2016. ^ a b c d e f g "Antártida" (in Spanish). Ministerio de Ambiente y Desarrollo Sustentable de la Nación. Archived from the original on 11 November 2016. Retrieved 11 November 2016. ^ a b c d Izaguirre, Irina; Sánchez, Rodolfo. "Situación Ambiental en La Antártida e Islas del Atlántico Sur" (PDF) (in Spanish). Archived from the original (PDF) on 14 December 2016. Retrieved 14 December 2016. ^ a b c d e "Estadísticas Climatológicas Normales - período 1981-2010" (in Spanish). Servicio Meteorológico Nacional. Retrieved 21 April 2018. ^ a b c d e "Clima en la Argentina: Guia Climática por localidades". Caracterización: Estadísticas de largo plazo (in Spanish). Servicio Meteorológico Nacional. Retrieved 21 April 2018. ^ Bordeleau, Andre G. Flags of the Night Sky: When Astronomy Meets National Pride. Springer Publications: 2011. p. 118. ^ Bordeleau, Andre G. Flags of the Night Sky: When Astronomy Meets National Pride. Springer Publications: 2011. p. 119. Menutti, Adela; Menutti, María (1980). Geografía Argentina y Universal (in Spanish). Buenos Aires: Edil. Wikimedia Commons has media related to Antártida Argentina.